The Simpsons is now officially the longest-running scripted series in television history. In its 29th season, The Simpsons has finally taken over Gunsmoke, the previous record holder, which ran for a grand total of 635 episodes. With Sunday's latest episode, Homer, Bart, Marge, Lisa and Maggie made it to 636. It's a record that the show may very well hold forever, considering that they still may have a long way to go before it's all over. Fox has already renewed The Simpsons for season 30, which will kick off this fall. That means the series will at least pass the 350 episode mark before the ends of its run. "I say reboot 'Gunsmoke' and keep TV's hottest rivalry going strong," joked executive producer Matt Selman in a recent interview. That may sound crazy, but given the modern TV landscape, it's not as crazy as it sounds, but probably won't happen nonetheless. Producer David Silverman wrote the record-tying episode, which aired last week, and talked a bit recently in an interview about the experience. "The record-holder for most seasons was of course 'Gunsmoke' at 20. Once we broke that, I had a feeling we would go to at least 30 seasons. And I was looking towards breaking the 635 [episode] mark, it seemed a strong possibility. But I never thought that I'd be writing the tying episode. That was completely happenstance." Can anyone else ever hope to break this record? Right now, the closest show is Law and Order, which has an impressive 456 episodes and 20 seasons under its belt. Lassie is also surprisingly high up there, with 17 seasons and 547 episodes, but the odds of a revival coming up to give that show a chance are slim to none. The drop off from there is pretty steep. Matt Groening created The Simpsons, which started its historic run on Fox back in 1989. However, the family first debuted in 1987 on The Tracey Ullman Show in a much more crude version than what we're accustomed to now. Somehow, the show has managed to stay relevant enough to be on the air for three decades, which is something almost no other show of any kind can say. At its best, the show has produced some of the best and most classic TV ever created. While those days are largely behind the series, it's still managing to find an audience in the very crowded modern TV landscape. 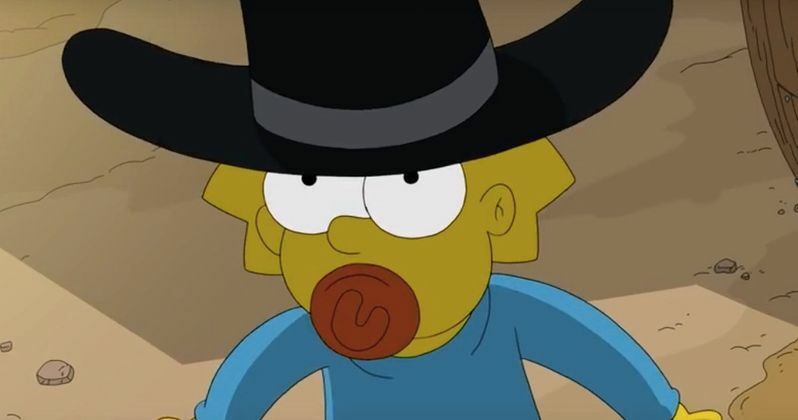 To celebrate the occasion, The Simpsons did the episode's opening in the style of Gunsmoke, which ran for 21 seasons from 1955 to 1975. The opening sees Maggie getting the draw on Marshal Matt Dillon. This is not the first time the rambunctious baby has used a gun, as she was famously the one who shot Mr. Burns all of those years ago. You can check out the opening sequence from The Simpsons record-breaking episode 636 for yourself below. This news comes to us courtesy of The Washington Post.